Alta Irrigation District is located on the east side of the San Joaquin Valley, in Tulare, Fresno and a small portion of Kings Counties. The towns of Dinuba and Reedley are within the district's boundaries. The district's surface water supply is from the Kings River, with irrigation releases from Pine Flat Dam. 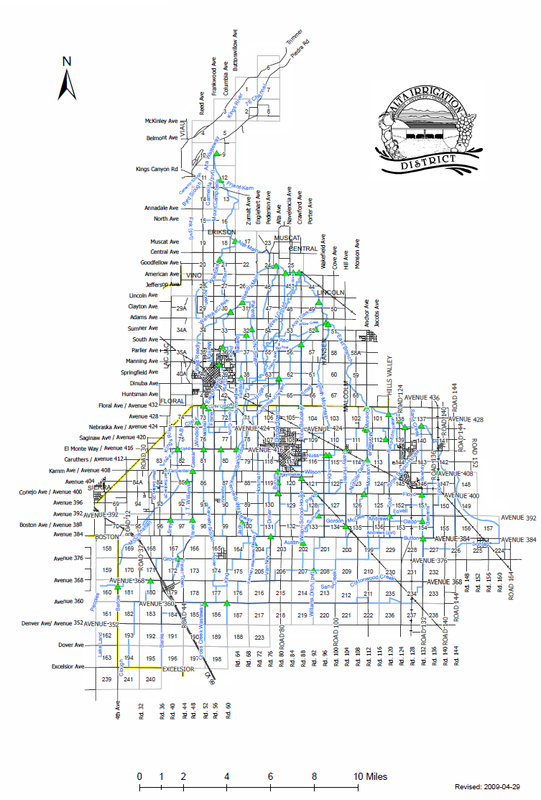 The 76 Land and Water Company was formed on June 7, 1882 with $280,000 in capital stock divided into 14 shares. The company took its name from Tulare State senator and cattleman Thomas Fowler’s "76 Ranch" which had significant land holdings in the area. In March 1884, the company moved its headquarters from its original location in Visalia to the newly formed town of Traver. The original intent was to develop a water supply and canal network to divert water from the Kings River to serve lands owned by the company near Traver. Alta Irrigation District supplies water to users on a modified arranged schedule and charges for water on a volumetric basis. Surface water users that flood irrigate can irrigate once every 15 days or so; according to the ditchtender's schedule. Growers using drip/microspray have more flexibility in their water ordering (they can take smaller flow rates more frequently). Water users place water orders by calling ditchtenders' cell phones directly. Water users can operate their own turnouts. Volumetric measurements at farm turnouts are made by using a modified constant head orifice for flow rate measurement and recording the time the turnout is on and off. The District charges a per acre charge to cover all non-water run costs. The district has 10 ditchtenders and 3 water dividers. The water dividers monitor flows throughout the district as well as reservoir elevations and spills. They tell ditchtenders what flows are available early in the morning. Groundwater recharge is a major function of the district. The district prevents spill as much as possible by using terminal reservoirs at the ends of laterals where water is allowed to percolate. Recharge basins are located within the district for groundwater recharge as well.